Increase your gaming experience / your workplace experience with the CSL USB gaming mousing SM-610! into your hand thanks to its ergonomic design and sophisticated surface appearance and always looks good! hand and the well thoughtout design provides great comfort. The high precision optical sensor is also resistant to external influences such as dust. The mouse works on almost any surface and slipping is prevented thanks to great stability. combination which makes it even more attractive. 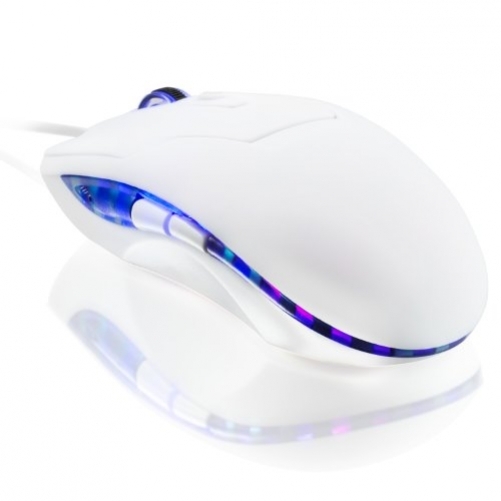 Model name: CSL USB Gaming-Mouse SM610Improves the gaming experience thanks to precise and smooth cursor control / 2400-dpi-sensor integrity / sampling rates: 800 / 1600 / 2400 dpi (individually adjustable)odel name: CSL USB Gaming-Mouse SM610Thumb buttons designed for right-handers | vertical precision scroll wheel | works easily on almost any surface | also suitable for gaming playersAttractive ergonomic design | additional stylish LED-lighting in the colours blue/redVery easy driverless installation thanks to Plug & Play | flexible connection options USB 1.1, USB 2.0, USB 3.0-support | cable length: approx. 1.2m (metres) | Basic colour: white | supported operating systems: Microsoft Windows XP / Windows Vista / Windows 7 / Windows 8 / Windows 8.1 (32- and 64-Bit) as well as MacOS etc. Es ist noch keine Bewertung für CSL - 2400dpi Gaming USB Mouse SM610 White abgegeben worden.